I thought I would bake strudel this week as I wanted to try and make the pastry that goes into strudel. Strudel is a sweet dough that takes lots of kneading and stretching. It needs to be stretched into a very thin sheet that you can see through. It should be so thin that you can see lined paper underneath it. 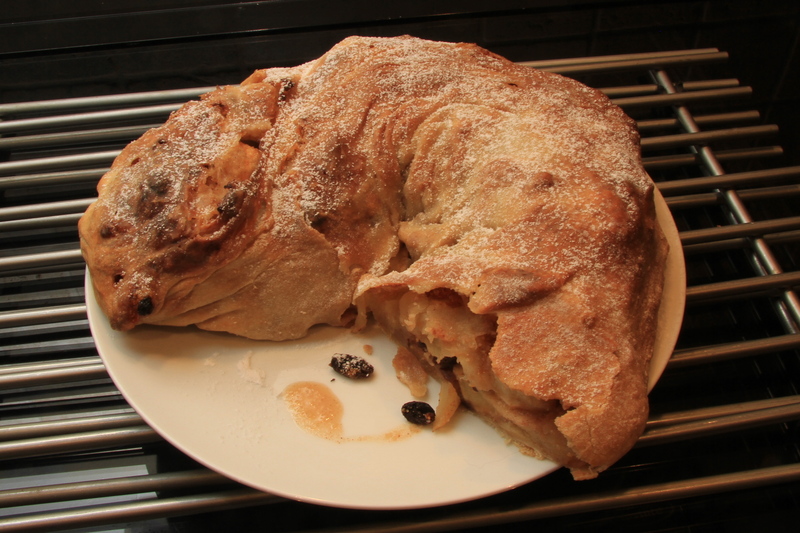 I made a traditional apple strudel with raisins, cinnamon, apple and ground almonds. This bake had lots of new techniques for me and I did have to get a bit of help when stretching the dough. Did you know:- A strudel is a type of layered pastry with a filling that is usually sweet. The pastry comes from the Turkish Baklava which came to Austria in 1453. The name “Strudel” means Whirlpool because the dough is rolled around the filling and the center of the pastry looks like a whirlpool.